Photo courtesy of Aqua Greens. Pablo Alvarez and Craig Petten are Toronto natives with a combined 40 years of experience in the food industry. 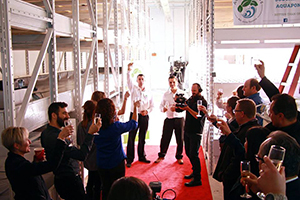 By starting a new aquaponic farm in their home city, the co-founders hope to both increase Toronto’s food stability and increase people’s connection with their food. Alvarez and Petten first discovered aquaponics during their time at Humber College, where they majored in Sustainable Energy and Building Technology. After 20 years working in the hospitality industry in Toronto, the pair founded Aqua Greens. As Petten explains, their work in hospitality allowed them to see first hand the lack of connection between food and its source. The fish in Aqua Greens’ aquaponic system are fed organic, non-GMO food. The fish convert the food to ammonia in their waste. Water from the fish tank is bio filtered to strip out the solids. As the water travels to the plant beds, naturally occurring bacteria convert the ammonia to nitrites and then nitrates. The nutrient-enriched water bathes the plant roots, and the plants clean and filter the water before it returns to the fish tank. Because of zoning laws that prohibit agriculture in the city of Toronto, Alvarez and Petten established Aqua Greens in the neighboring town of Mississauga. The duo is enthusiastic about the community, stating that the town has embraced their business. At the same time, Alvarez and Petten are hoping their success will ultimately influence Toronto’s laws against urban agriculture, and that they will be able to expand into the city, because the majority of their vendors are in Toronto. Alvarez and Petten are quick to note that while they are enthusiastic about increasing the reach and impact of aquaponics, they aren’t interested in replacing established, traditional farms in Ontario. With this in mind, Alvarez and Petten have established relationships with existing growers, farmers’ markets, retailers, distributors, and restaurants. Through a successful Kickstarter campaign that gave them needed capital to start their business, Alvarez and Petten built a community of stakeholders and are excited to give back to the people who embraced their vision. After harvesting their first crop of greens, Aqua Greens introduced its products to Toronto’s Wychwood Barns farmers’ market on February 21, 2015. Feedback is important both t to respond to consumer needs and because Petten and Alvarez see education as an important part of their mission. “As much as we’re trying to provide a sustainable food system for our city, education is a huge part of our work. That’s why we want to connect with people,” says Alvarez. To that end, Aqua Greens has started an outreach program to the schools, and is partnering with The Stop, a community center and food pantry in Toronto. With this in mind, Petten adds, “the sustainability and stability of our food systems are tenuous.” Taking their lead from mentors such as Jim Gill and Ken Chio of Michigan-based Aqua Growers, Alvarez and Petten see a future in which urban agriculture such as aquaponics revitalizes areas of urban blight, while providing fresh, delicious produce to urban dwellers.